This analysis, an extension of my Open Letter to 9/11 Truth Chiefs, April 30, 2011, is extracted from Footnote  of my Comment on Judy Wood's 'The New Hiroshima'. The presentation in this addendum emphasizes the common problem faced by all the HOW detective chiefs of the 9-11 Truth in their respective calls for “New Investigation” of how the WTC towers were destroyed on 9/11. Over the past decade, each of them appears to have gathered around their respective HOW narrative, largely the type-2 demographics identified by Adolf Hitler in Mein Kampf as the “useless for any form of positive work”. Just like the mainstream flock with whom they had parted company from, identified by Hitler as the type-1 demographics composed of “the crowd of simpletons and the credulous”, was, and still is, gathered around the officialdom's narrative. Their common problem – indeed for all calls for “New Investigation” – is epistemology. This analysis examines just one piece of exemplary evidence brought forth by both Steven Jones and Judy Wood, each arguing the opposite thesis, one says it was hot, the other says it was not, to advance the commonsense argument that all HOW exponents, regardless of their personal inclination, must first come to grips with the Epistemology of 9-11. The following question must first be answered: What is evidence? It is expanded upon below. My earliest cached copy of Steven Jones' online version of his very first "peer-reviewed" "published paper", “Why indeed did the WTC buildings completely collapse?”, is available from archive.org. Its timestamp in the PDF Summary is: September 7, 2006 (Created: 9/7/2006 5:04:13 PM, 48 Pages, 1.13 MB, Acrobat Distiller 7.0 Windows). As I had observed in my letter to my 9-11 truther co-alum from MIT back in February 2011, I had downloaded four copies of Jones' paper over 2006-2007, not realizing that each time I was saving a slightly different version which had been revised after the advertised publication date noted in the paper's footer: Journal of 9/11 Studies September 2006/Volume 3. This cached version is identical to the one cached and cited by Judy Wood as the source of her fig 6 (see below).
" S. E. Jones, “Why indeed did the WTC buildings completely collapse?”, Journal of 9/11 Studies, vol. 3, pp. 1-47, September 2006. [Online]. Available: www.journalof911studies.com [Accessed March 17, 2008]." The fig 6 of Judy Wood is present on page 18 of the first two versions [a] and [b], but it has been substituted by another photograph in versions [c] and [d] without intimating the reason for substitution in the paper. Here are the Diff images of page 18 between the version cited by Judy Wood (which is identical to [a]) and [b] [c] [d]. As one can see, Judy Wood's fig 6 no longer appears either in that 47 page version issued on January 25 2007, or in the one issued before it, on November 14, 2006, but is present in both the September 7, 2006 and October 9, 2006 versions. The credit is to Judy Wood's scholarly tenacity, or shall we say scholarly paranoia given that she knew she was in the domain of deception, that she did not shy from due diligence and unearthed the discrepancy in color temperature in the photograph on page 18 of the version of Jones' paper she evidently scrutinized and checked. As a diligent scholar, one presumes, she dutifully brought the finding to the attention of her peers in her fig 5 vs fig 6 comparison. Caption Fig 5 and Fig 6 from Judy Wood's evidence stream Dirt4. Is the color temperature evidence of heat in fig 6? The super-fireman attired in short-sleeves displaying his bare forearms, visible more clearly in fig 5 as the one in blue shirt in the act of shoveling dirt from the rubble while standing in it, doesn't seem to care very much about that heat! 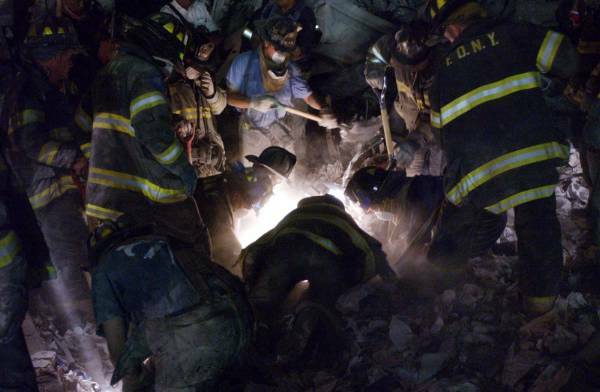 Even if both images have unnatural color temperatures, the content of the otherwise identical images at least indicate that the fireman could withstand whatever heat there was in the rubble on his bare forearms. The brightness in the hole, as Jones had himself suggested in the October 9, 2006 version of his paper before making that silent image substitution in the November 14 2006 version, may have been due to bright (white) light. Regardless of Jones' scholarly motivation for the silent substitution of the image, the color temperature shift in fig 6 in comparison to fig 5, is revealing of another even more significant and egregious matter that cuts to the very heart of the epistemology of 9-11. Comparing fig 5 and fig 6 makes immediately apparent to even a novice person, how color temperature (and other content) can be trivially altered with Photoshop-like tools in cryptographically unauthenticated digital images unsecurely downloaded from the internet, and how easy it is to fool anyone of anything with photographs, presumably even of real events. In this instance, from the existential evidence of fig 6 and its attempted use by a scientist of Jones' calibre no less, it is clear that the debris can be made to appear hot just by changing the color temperature of the photographs because the public mind is attuned to associating hot with the glow of red from their daily experiences. Given this example, and one worthy example is usually sufficient to establish a rule as well as the exception, how can one be sure of anything about the rest of the photographic evidence of 9/11? To mitigate such mischief and lend veracity to photographic evidence in court, authentication of images is done by inserting a cryptographic signature into the raw image record itself at the time of image capture in-camera, before the image leaves the camera body. It is the only authentication acceptable in a fair court of law for digital images, and is the holy grail of law-enforcement agencies who present material evidence in such fair courts for its admissibility. Digital camera companies make specialized camera versions with carefully scrutinized verification software capable of such cryptographic authentication of digital images captured by their device; that images remain untampered end to end when presented as evidence. So, demonstrating “hot” by way of color temperature is wanting of more empirical and material data to substantiate that assertion. The incongruity of the fireman in fig 5 (cited by Judy Wood as sourced from http://hereisnewyork.org/ whose Registrar Organization is listed by Whois: Roy Rosenzweig Center for History and New Media, email address of Registrant: @gmu.edu), not wearing specialized attire for very high temperatures, and instead wearing only a short-sleeved shirt with his forearms bare, shoveling rubble while standing right at the edge, or inside, what is alleged “hot” by Steven Jones, arguably demonstrates that it cannot really be all that hot. Tugging on just one loose thread unravels the best of knitted wool sweaters! Here is a blowup of that photo in fig 5 from the source –– judge for yourself hot, or not hot. Caption Can that brilliantly glowing substance in the rubble really be hot like a blast furnace that melts structural steel into molten flowing lava? The fireman in blue standing at the edge, or almost inside, of that glowing puddle is in short-sleeves, with his forearms bare! If that cauldron is indeed hot to melt structural steel, why isn't the fireman suitably attired for that temperature? In his short-sleeves, why isn't his arms scorched from that heat? Something does not add up. The firemen's oral reports cited by Jones in his paper say the rubble was hot. At least this photograph suggests not that hot, and the source of that bright glow is something else. Jones himself suggested it could have been light inserted into the hole. How to decide? What is evidence? This analysis once again begs the question: What is evidence? Is an unauthenticated photograph evidence? Is an unauthenticated video recording evidence? Is an oral testimony evidence? Is logical reasoning evidence? Is two plus two making four evidence? Is deductive reasoning applied to data evidence? Is inductive logic applied to data evidence? Is commonsense applied to data evidence? What are the rules of evidence? And who, or which legal body, will decide this? The one who can shout the loudest? Or have the largest or most zealot fan following? Today, the establishmentarians, including their scientists, their logicians, and their experts across the board, reject commonsense and deductive reasoning applied to data as evidence. When the world witnessed all the floors of a tall building collapse in near free-fall, at virtually gravity acceleration g, they still refuse to accept the commonsense observation that none of the floors experienced any resistance from below, and thus the logical deduction that all resistance beneath all floors must have been removed simultaneously. The conclusion this logical deduction leads to is only singular if two plus two is permitted to make four: the resistance beneath each floor that propped up that floor in its normal state must have been removed for all floors in a controlled manner simultaneously so as to bring the building down symmetrically into its own footprint. Pretty simple logic that takes one immediately to WHO: Who had the means, motive, and opportunity to plan and orchestrate such a precision controlled demolition with military-style secrecy of WTC-7, without the need for any further material evidence from the no longer existent debris field (see 911 The Sacred Cow of Science). But that reasoning is outright rejected! It is instead called “conspiracy theory” by the tallest and fairest intellects of the realm. In an analogous manner, among those who continue to argue the detailed mechanics of the HOW in their dissent with the establishmentarians' version, some also reject what the world also witnessed the same day on their television screens: tall towers comprising millions of tons of concrete-steel structures turning to instant dust in a demolition wave that was also free-fall at gravity acceleration g per floor, or even faster, as it actually appears to be. They reject that the observation that millions of tons of steel-concrete structure turned to instant dust, is even a valid observation --- when it is right before their very eyes (See: Some of the principal data that must be explained, compiled by Judy Wood by observation) --- for that would again immediately take one to examining means, motive and opportunity without seeking further “material evidence” from the no-longer existent debris fields. The two antagonists fielding opposite narratives seem to have common modus operandi – to avoid, by every means possible, going to means, motive and opportunity, the staple of forensic science, which would automatically identify the WHO: Who has the potential military science and technology capability to mutate millions of tons of steel-concrete structures into instant powdered dust, and plan and orchestrate that never before seen catastrophic decimation of WTC-1 and WTC-2 with military-style secrecy and military-style effectiveness in the most armed to the teeth sole superpower on earth with full control of the narrative? But the self-appointed detectives of dissent space of America still continue to endlessly debate the competing HOW modalities with almost religious fervor. None of them, evidently, have understood the political theory behind 9-11 which also explains their own behavior (see The Political Theory behind 9-11). Thus we see that the determination of rules of evidence and rules of observation must be made ab initio, from first principles that were so forcibly introduced into the Western Mind by the Renaissance philosophers who put emphasis on intellectual reasoning and logic over faith in god's authority figures, as the principal means for understanding the world. They had borrowed that idea from the ancient Hellenic world to finally dispel their Dark Ages. Modern science, as a means for understanding reality, was born when this first principle was applied to empiricism and experimentation to make models and theories to explain reality, which others following the same principles could falsify (prove true or false) by their own observations and experimentation, and thus continually extend the domain of human knowledge. This first principle is the sine qua non of any sensible ex post facto (after the evidence has long been obliterated) scientific investigation of the HOW of 9-11. But for some reason, faith in authority figures continues to dominate the Science of 9-11. This is also easily explained by the Political Theory behind 9-11 applied to Hitler's demographic classification for engineering both consent as well as dissent in Western Democratic societies that cannot ignore type-2 as Hitler had done under the bayonet of Nazi Socialism. It is examined in Weapons of Mass Deception – The Master Social Science. And we are right back to the square-one epistemological problem of 9-11. In the absence of the government having carefully preserved the crime scene, or the material evidence from it for forensic analysis of the real cause of the cataclysmic destruction of the entire WTC complex, all that latter day wannabe investigators and future historians are left with, are these unauthenticated photographs (including television news broadcast videos), and official narratives which have been canonized as “fact” by the fiat of power. But there is something else left behind too: copious evidence of plans for aggression calling for a “New Pearl Harbor” to prime the public mind for “imperial mobilization”. “The plans of Adolf Hitler for aggression were just as secret as Mein Kampf, of which over six million copies were published in Germany” (Justice Robert H. Jackson, in his closing speech at Nuremberg, on Friday, 7/26/1946: Morning Session: Part 3, in Trial of the Major War Criminals before the International Military Tribunal). Shown below is Mr. Ayres full statement, which will be made available on the AE911T.org website with this press release. "I am a consulting mechanical engineer with over 55 years of experience in the design and construction of all types of buildings including high-rise office towers. I am an expert in heating ventilation and air conditioning (HVAC) and fire protection for buildings. I have authored 41 technical papers and I am a chapter author in 3 books covering HVAC systems, building and energy requirements, solar heating and cooling applications, thermal energy storage and earthquake damage to building nonstructural systems. I support the work of Dr. Steven Jones. He has provided a scientific foundation for the collapse of the three World Trade Center (WTC) towers. I read the FEMA September, 2002 report, prepared by the American Society of Civil Engineers, and initially accepted their theory of the collapse of WTC 1 and 2. As more information became available on the web, I was motivated to research the subject in a more rigorous manner. I have carefully studied the Jones 2006 paper, “Why Indeed Did the WTC Buildings Completely Collapse?” and concluded that it is a rational step-by-step study that meets the accepted standards for scientific building research. His critical reviews of the FEMA, NIST, and 9/11 Commission reports are correct. I have signed his petition calling for the release of all U.S. Government- held information regarding the events of 9/11/2001. Steven Jones’ call for a “serious investigation” of the hypothesis that the WTC 7 and the Twin Towers were brought down, not just by impact damage and fire, but through the use of pre-positioned cutter-charges” must be the rallying cry for all building design experts to speak out. Dr. Jones is following in the footsteps of Dr. Linus Pauling of the California Institute of Technology, who rallied his fellow scientists to oppose the development of the Hydrogen Bomb and the testing of nuclear weapons. He was later awarded the 1962 Nobel Peace Prize for these efforts." What indeed is that fantastic Nobel prize winning discovery that Jones has brought forth in “Why Indeed Did the WTC Buildings Completely Collapse?” which this authority figure feels is: “rational step-by-step study that meets the accepted standards for scientific building research”? This exemplary color temperature exposé sets a rational precedent, and is equally applicable to the rest of Jones' images in his write-up which he brings up as evidence of “hot”. It is not the color temperature of the photograph, but the effect of the object under consideration on the surrounding, that determines hot or not hot! To generalize that commonsense, the (visible) effect adjudicates the presence or absence of the (often hidden) cause(s). To exemplify that commonsense: If one observes in photographic and broadcast television data millions of tons of steel-concrete structure instantly pulverized into powdered dust, it is logical to assume a “force” that caused it. No 'conspiracy theory' there. No speculation there. Only simple logic. To apply that commonsense: Both fig 5 and fig 6 show not hot because there is no heat effect on the arms of the fireman! This self-evident logic makes all such unauthenticated photographic evidence where determination of effect on surrounding cannot be made, irrelevant, regardless of how warm or cool the color temperature is made out to be. Applying this logic based forensic yardstick to Jones' other “hot” photos on page 17 of his latest January 25 2007 write-up, makes them irrelevant, since the effect of the supposed heat on the surrounding cannot be ascertained! There are other sets of imagery data available on the web where the effect on surrounding is immediately visible --- such as the WTC Waterfall captured in the photograph gracing Judy Wood's book cover. The WTC tower is observed to be instantly pulverized into dust top-down, in an ever expanding dust cloud that cascaded like a waterfall. In videos captured of this event which most people on planet earth with an internet connection must have surely seen, its steel-concrete floor structures is observed to almost pulverize into a cloud of dust in mid-air, in what appears to be a precision-timed, precision-controlled, top-down demolition wave which descends floor by floor, in an ordered manner, at an acceleration that simply boggles the mind. The effect on the surroundings by this dust field in which no particular effect of intense heat is seen anywhere, and which is all what appears to have remained of most of the millions of tons of steel-concrete structures that were there moments earlier, was captured by many television news broadcasts of that day. ABC News had convened a special documentary a couple of years after 9-11, emphasizing this never before witnessed phenomenon of millions of tons of steel-concrete office building instantly pulverized into dust clouds which came rushing out from the epicenter with gale force winds, leaving behind no solid debris other than unburned office paper which was seen to be flying everywhere. There were no other remains of a typical occupied office building in the rubble after the dust had settled. It had also asked why. Judy Wood's perceptive observations on the effect on the surroundings are curious in so far as she is evidently the lone ranger among the HOW crowd to persistently emphasize examining all the available evidence, and not just bits and pieces of one's preferred evidence in confirmation of one's pet HOW theory. See: Some of the principal data that must be explained, which lists effects besides those captured in photographic imagery. Which of these items is actually “evidence”? How shall one decide that, on which yardstick? For the yardstick of credulity of photographic imagery, can a forensic scientist reasonably discard all unauthenticated photographic evidence as at best “non-conclusive” when it does not show effect on surroundings, maintain a maybe or circumstantial or something to be explained if other incongruities do not exist in them and the effect on surrounding make the matter self-evident, and at worst as deliberate red herrings, and search for other material evidence of intense heat that reasonable minds may postulate? What is Jones' other material evidence for intense heat, other than the vicarious oral reports the 9-11 Truth chief assures us exist and make for reliable science? Right – there is none, because the crime scene is gone! The HOW problem is mathematically constrained by the removal of the crime scene. Game theory scenario employed in the planning of this dastardly deed would have also predicted that this crime could never be solved in this way in any ex post facto scrutiny if the crime scene and material evidence were quickly cleared away under suitable propaganda cover. And logicians and criminologists would know this. Those who ordered clearing away the crime scene in a hurry certainly understood it. Thus if any type-2 were to “wake-up” after the fact, and demand a new investigation from the government, the game-theoretic planning would have indicated that this crowd could easily be put on this HOW treadmill forever. While fait accompli would ensure the success of the ambitious 9-11 imperial mobilization project of “history's actors”. Thus make all the demand for new serious investigation you want –– knowing fully well it won't go anywhere –– and occupy the minds and energies of the simpleton, the gullible, the credulous, and the malcontent, with “beneficial cognitive diversity” lest they collectively refocus their public energies on derailing imperial mobilization instead!